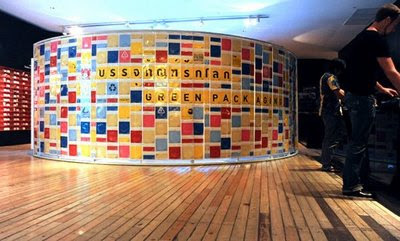 Here we go: our latest work at TCDC, “Green Packaging” or “บรรจุภัณฑ์รักโลก” by Material Connexion Bangkok, during 21 April – 24 May, 2009. 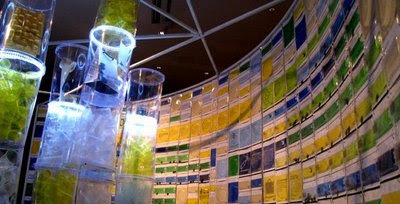 This small exhibition has rather complex process of production, however, finally we did it! Thanks to all the people involved indeed. 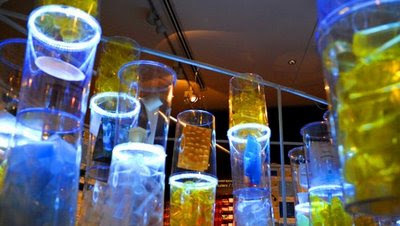 About three months ago, Wuttinan, a very good friend of mine, who is an interior & exhibition designer gave me call asking us to work on this exhibition design. 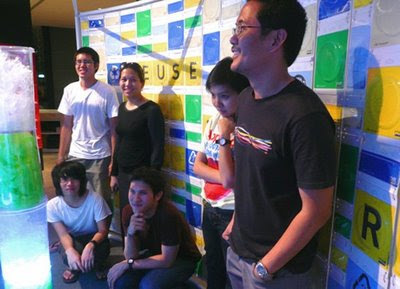 He was working as a curator for this exhibition with Material Connexion Bangkok. 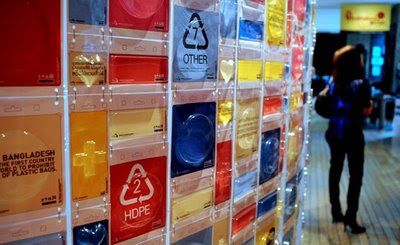 Wutttinan gave us the ideas of packaging that is pretty much linked to consumption and waste. 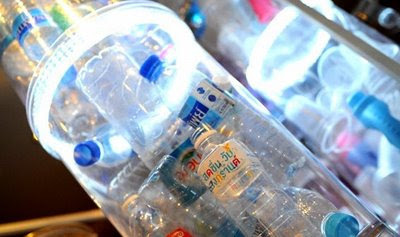 The more people consume, the more packaging they use, the more waste we have. Working with him throughout the process was great fun, since we always had interesting discussions, exchanging ideas, alternating design and so on. Very exciting indeed. 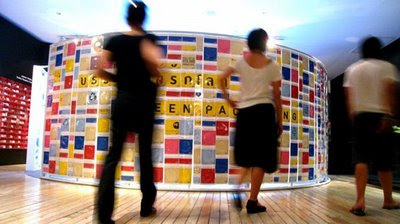 The exhibition contains mainly 3 parts: the first parts is the schocking facts about the how much package we consume which is mainly displayed on the outer skin of the exhibition. 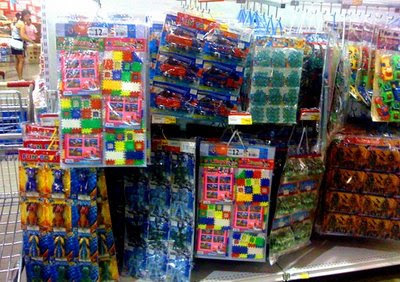 The skin is made of this plastic package type usually use for toys or small electronic parts. 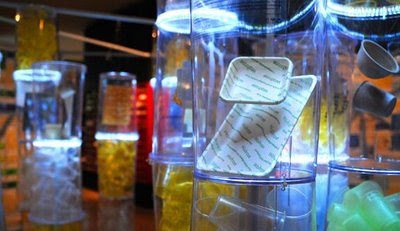 Given the durability, the cost and the heavy duty travelling display of the PVC plastic, we believe that our solution is pretty ‘green’ compares to other materials. We made the packaging with 4 shapes: circle, regtangular, cross and, of course, heart shape with paper containing different information and color. 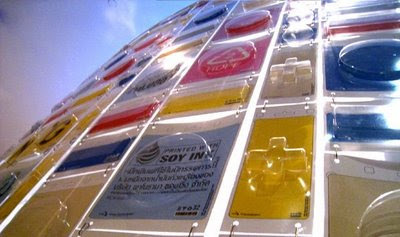 It was also the first time we used Soy Ink to print all over 1800 cards by our small inkjet printer sponsored by Panorama Soy Ink through Material Connexion. Thanks to Net, our graphic designer who spent 5 full days doing this. :O Not to mention, that we had to cut, to make a hole and tire them all together in system. We were lucky to have many students of mine helping us to do this very labour intensive job! Here is the process of making the plastic package from a sheet of plastic, then cut, and fold, another super labour intensive job! The graphic design is also very important part of this exhibition. Wuttinan gave a brief of a graphic image of ‘product': like in a supermarket where you are overwhelmed by all the products with different labels and packaging. Piyapong and Net, our graphic team solved the brief with very intelligent and cool system! 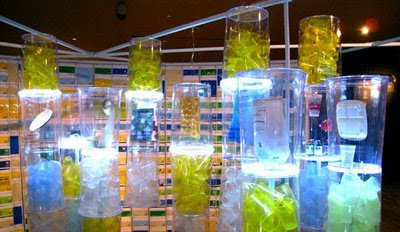 The second part is about the concept of “acting Green” ; REDUCE, REUSE & RECYCLE with various packaging materials. The information is displayed in the inner skin. 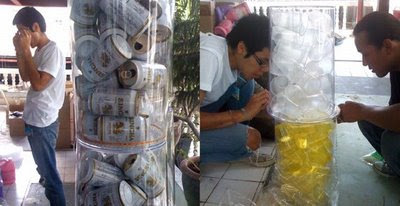 We used the transparent plastic garbage bins as containers of objects such as PET bottles, metal cans, bottles, we want to display. 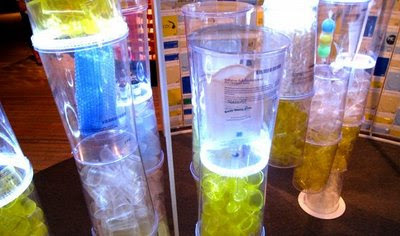 (Since few years ago, a public bomb was placed in a garbage bin, all the public garbage bins in transparent plastic like this became a common object, pretty nice!) We wanted to convey the connection of consumption and garbage as well. 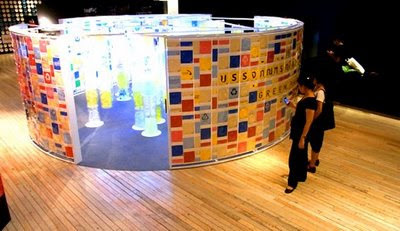 28 different columns made out of garbage bin contain different materials, some hanging, some standing. Of course, it was not simple at all. Tanakul, our main contractor did a very good job again. 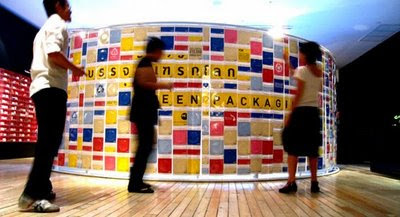 The major part of the exhibition is to display 16 different alternative packaging materials from Material Connexion Bangkok. 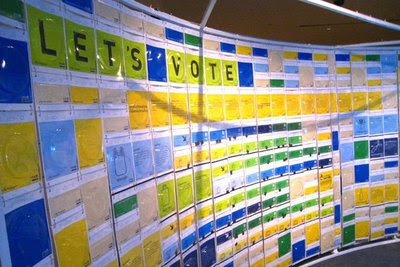 The third part of the exhibition is ‘Let’s Vote’, it gives a chance for visitors to consider different packaging materials how ‘green’ they are. At the set up. Very simple but labour intensive indeed. We are done! Exhausting but great fun! 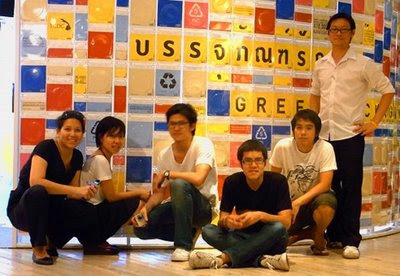 If you are in Bangkok, this exhbition will be at TCDC until May 24, 2009. But if you are somewhere else in Thailand, it is coming to miniTCDC near you very soon! 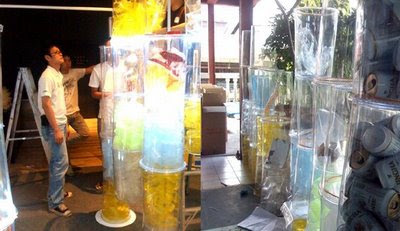 By the way, besides those who collaborated with us, we have to deeply thanks Material Connexion Bangkok, who let us explore this fun and interesting design. Good work comes from good client!, we all know.